Welcome to our pages of European Arms and Armour. Our armour has been designed to suit the needs of collectors, period re-enactors/living history groups as well as other re-enactment societies. Our Churburg armour is fully articulated and wearable. It boasts many of the features found on the original suit. Cuirassier Half Armour is hand crafted, historic dished steel armour. Includes rolled and roped edges. 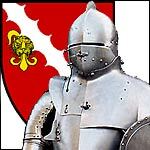 Includes Gorget, Pauldrons, Arms, Breast, Back Plate, Cuisses. Our Duke of Saxony Armour is a functional copy from an existing Renaissance Suit of Armor dating from 1550. Expertly hand crafted this historic dished steel armour includes rolled and roped edges and heavy duty leather straps. The Duke of Burgundy Suit of Armor harkens from the 15th century, a bloody one for Europe. The War of the Roses, problems in the French monarchy, the constant warfare between the city states of Italy and the final expulsion of the Moors from Spain - the whole continent seethed with bloody strife. Complete Suit of Wraith Armor made from 18 gauge steel with all leather straps and buckles. Inspired by the ring wraiths from The Lord of The Rings films, this armor will be made to your own measurements and will be adjustable. Our Gothic Suit of Armor replicates the style seen during the late 14th Century. Large sections of plate armor began to be added to mail during the middle of the 13th century. This continued until full plate armor developed sometime in the late 14th century. Two main centers for the production of armor were Germany and Italy.